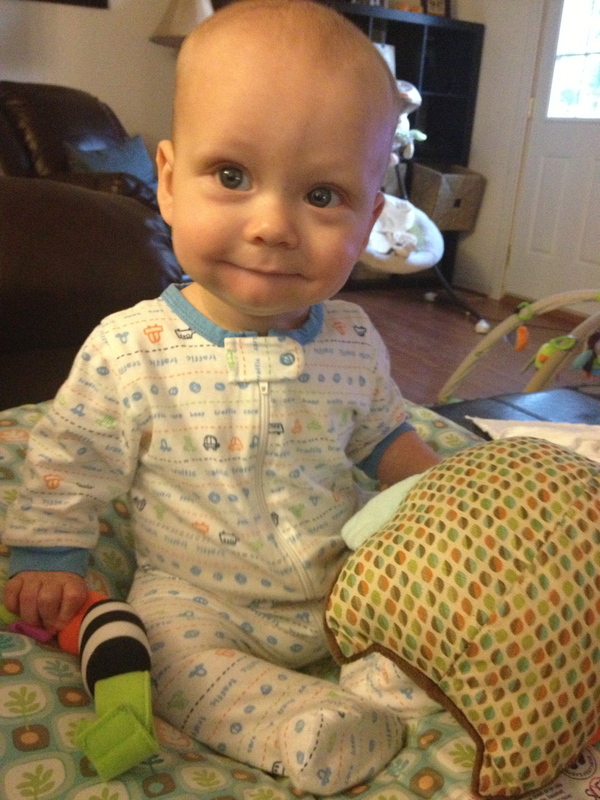 Here is a 24 hour snapshot of what life is like for us at 7 months old. I took these pictures on Wednesday, April 24th. It was a typical work day and we were in the middle of sleep training, so it looks much different than the last DITL post when I was on Spring Break! 5:30 a.m. Alarm goes off. I get up, shower, and get ready for the day. I also pump. Now that Kevin wakes up later and sleeps longer at night I need it to pump right when I wake up. 6:15 a.m. I finish getting ready and head downstairs. Kevin’s already down there making lunches and breakfast for both of us. 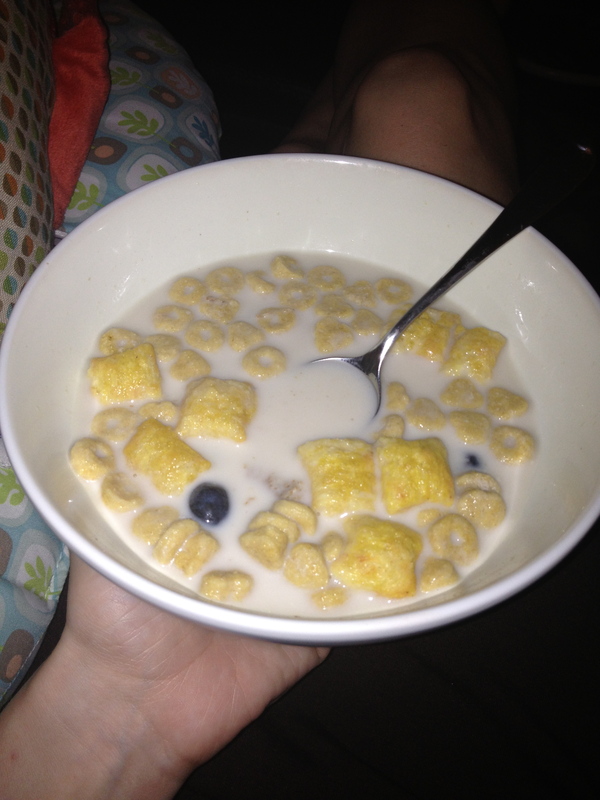 Today I have cereal with blueberries and almond milk. 6:27 a.m. 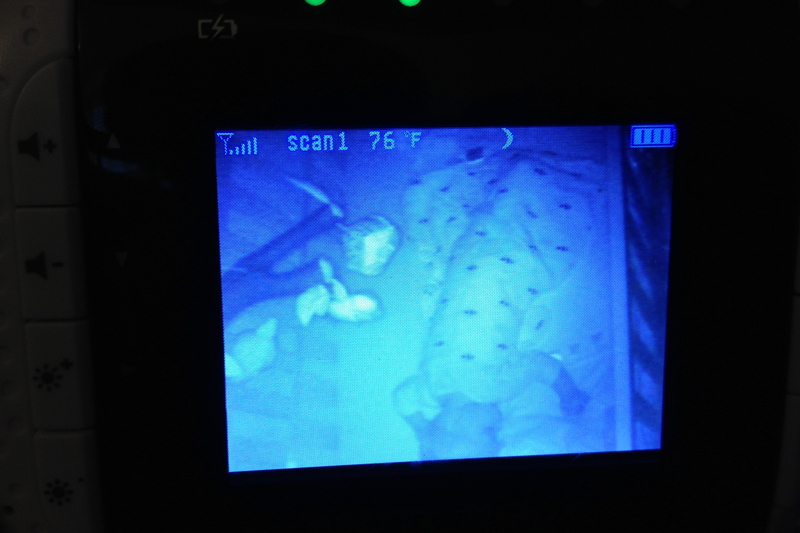 I hear the baby wake up on the monitor, a little earlier than usual. Daddy goes up to get him and play for a few minutes before he leaves for work. 6:45 a.m. Daddy’s gone, so I change the baby’s diaper and feed him a 6 oz. bottle of the milk I pumped earlier that morning. 7:10 a.m. Breakfast time for baby! He eats apple cinnamon oatmeal and loves it. 7:25 a.m. We go upstairs to clean the baby up and get him dressed for the day. 7:30 a.m. My babysitter arrives and we chat for a few minutes. Then I somehow drag myself away from this cute face to go to work. 7:35 – 8:05 a.m. Drive to work. There is traffic and I’m 5 minutes late for a meeting. Ugh. 10:00 – 10:45 a.m. Planning period. I had to pump during this time since I had a meeting before school and couldn’t pump before kids arrive like usual. I don’t like doing this because it messes with the timing of my regular pumping sessions and causes me to pump a little less overall. 3:30 p.m. I eat a snack, take care of some things at work, pump one last time, and then I’m out of there. 4:10 p.m. Leave work. Sit in traffic. Boo! 5:05 p.m. Finally make it home and our babysitter is in the middle of giving Kevin his bottle so I take over. I’m SO happy to see him! 5:15 p.m. Baby finishes eating and we play together on the floor for a little while. After being apart from him all day this is one of my favorite things to do when I get home. 6:00 p.m. Dinner time for baby! He is having pumpkin and banana. It was his first time trying pumpkin and he liked it! He devoured the whole pouch fast! 6:15 p.m. Kevin gets home with dinner from our favorite Mexican restaurant. He goes to work early now (7-3) because he coaches middle school baseball from 3-5. He loves it, but it makes his days really long. We decided to get dinner out tonight because we had no groceries and no motivation to cook. I got cheese and onion enchiladas with vegetarian refried beans and rice… and ate it all! My appetite is out of control lately. Also, baby is tolerating dairy fine when I eat it these days. YAY for cheese!!! While we eat, baby munches on a Baby Mum Mum cracker. He loves them. 6:45 p.m. Kevin takes the baby upstairs for a bath and I run downstairs to put the cloth diapers in the wash.
7:00 p.m. Bath is done, now time for daddy’s special baby massage! Followed by a fresh diaper and PJs. 7:05 p.m. I fed baby a little 2 oz. bottle of formula, then nursed him. I do this to make sure he’s full before going to sleep with the hope that he will sleep longer. 7:23 p.m. He’s starting to fall asleep after he finishes eating, so I quickly put him down in his crib. He didn’t cry at all and fell right asleep. 7:30 p.m. I go downstairs to add detergent to the washing machine, then make bottles for the next day. I pumped almost 12 ounces between my 3 sessions at work. Big difference from only 7 weeks ago when I was only pumping 4 oz. total at work! 8:40 p.m. After I hang up with Cynthia, Kevin and I start to watch Survivor. 8:49 – 8:51 p.m. Baby cries softly and then falls back asleep. 8:52 p.m. 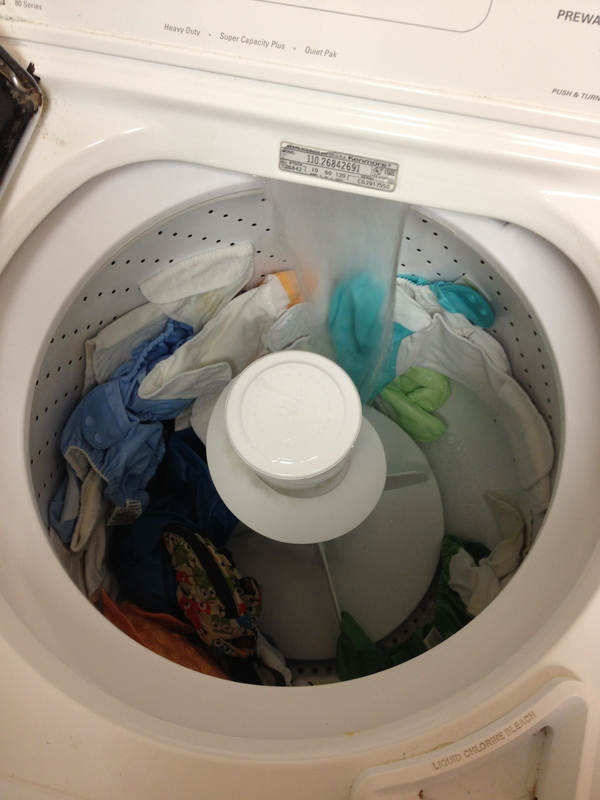 I run downstairs to put the diapers in the dryer. Then we continue watching Survivor. 9:35 p.m. We go upstairs to get ready for bed. 9:50 p.m. 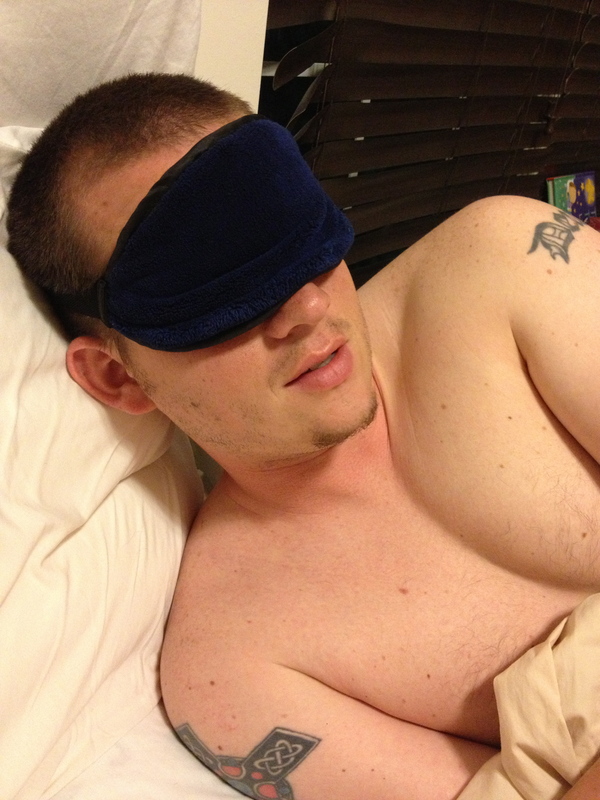 I pump 3.5 ounces before going to sleep and make fun of Kevin, who is wearing a sleep mask since I keep the light on while I pump. 10:00 p.m. – 5:00 a.m. SLEEP! Without any wake-ups from the baby! I woke up SUPER full and leaking, so I pump and get 7.5 ounces! 5:15 a.m. I get in the shower and the baby wakes up. Daddy feeds him a 6 ounce bottle of the milk I just pumped and changes his diaper. 5:35 a.m. Daddy puts baby back down in his crib while I get myself ready for work. He cries lightly. 5:45 a.m. Baby falls back asleep for a little while longer. What was baby up to while I was at work? Here are the notes my babysitter wrote down for me from this day. 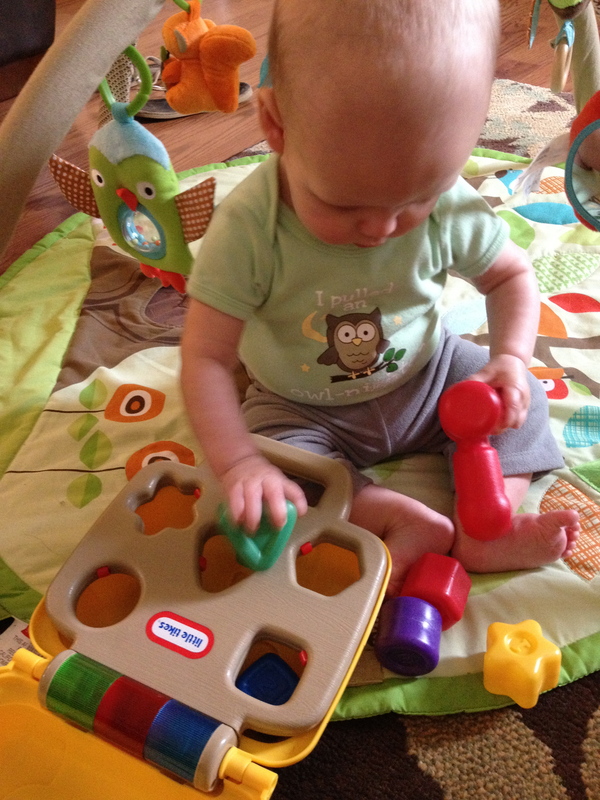 11:30 – 12:00 – Playtime, happy, really doing well sitting up! 5:00 – Diaper change, Bottle (5 oz. formula) – this is the bottle I finished giving him. # of hours spent nursing: Only 15 minutes 😦 the joys of being a working mom. Yes, sometimes he wakes up early and wants to eat and sometimes he doesn’t. Luckily when he does wake up now he’s been going back down easily for another hour or so! Oh my, so much pumping! You rock. Thanks Amber! I’m trying to hang in there until a year!